The question about a company’s business model is frequently answered by the information about the products to be sold with a price of x EUR. On an internal management level these answer is also often covered with a budget scenario, i.e. companies do a lot of calculation about cost- and price-scenarios (best-normal-worst) combined with a classical customer segmentation, based on quantitative, statistical or historical data. However a business model is certainly not an implication of a business plan or a budget scenario with a detailed financial plan. A business model is also not a strategy and a strategy is not a business model. The whole is more than the sum of its parts. A business model can be built on a company’s level as well as on a product* level and it is a composition of specific components which are describing the most important parts of a company’s logic at a high level. These components are the value proposition, the customer segments, the channels, the customer relationships, the revenue structure, the mission of the company, the key activities, the key resources, the key partnerships, the cost structure, the vision of the company, the internal and external critical success factors and relevant strategies to achieve, develop and defend the position in the market. The more the composition of these components fits to satisfy the customer needs – the job which have to be done for the customers – the higher is the probability of success. 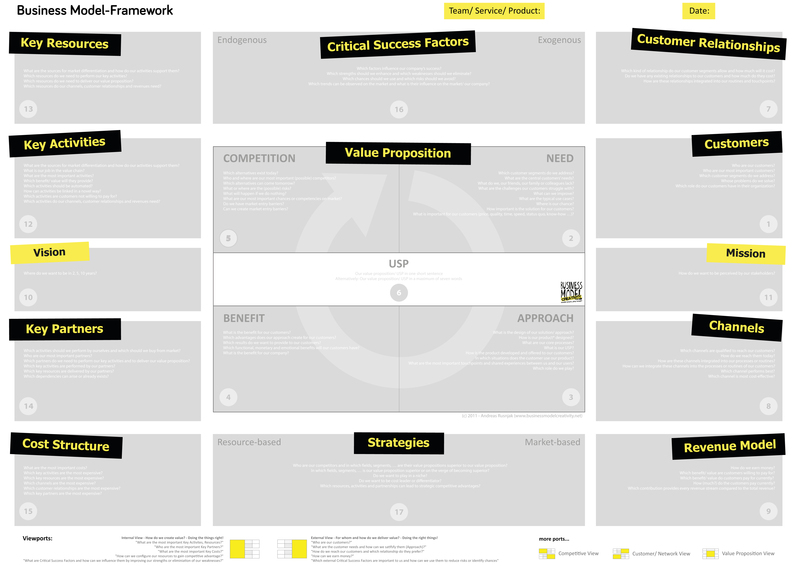 The value proposition is a vital point of a business model. It addresses the customers and it is the company’s argument or outcome to describe the concrete benefit for the customers in a very concise and understandable way. The value proposition is not the unique selling proposition, which is a complementary argument to describe the differences from competitor’s offerings. The value proposition is also not the value configuration, i.e. 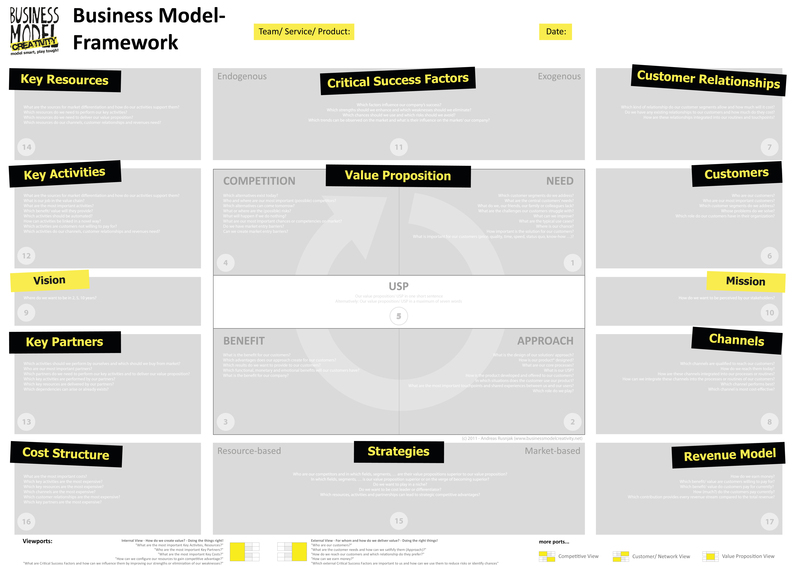 the composition of the business model components to create value for the customers. Strategies can be seen as the cement of a business model. They are describing a company’s specific way from point a to point b and leading to tactical and operative goals. The strategic goals needs to be a component of a business model to show the involved stakeholder the course. Contrary to strategies, which are very specific to the actual situation of a company in its market, views on a business model level enables relevant stakeholder to compare, benchmark and develop their business model more easy with business models of other companies on a high level. These meta-view helps to derive changes on the business model components, test these changes in the market and build relevant (simple) strategies for the company and for the future. Due to this strategies typically following a business model but a significant impact on strategies can also have an influence to a business model which can end in a pivot or business model redesign or the other way round. myboshi.net – Ein klasse Case… Was ist ein Business Model?